If your Bay Area arts education organization has not participated in our teaching artist employment survey, please provide your information here. Thank you! We will send you a link for your survey soon. As of the meeting time, the survey had been taken by 25 organizations. Michael Palladino, a member of the AEABA Executive Committee, has been volunteering quite a bit of time to handle to logistics of the survey and put in some hours late Thursday night to organize the data for this meeting. 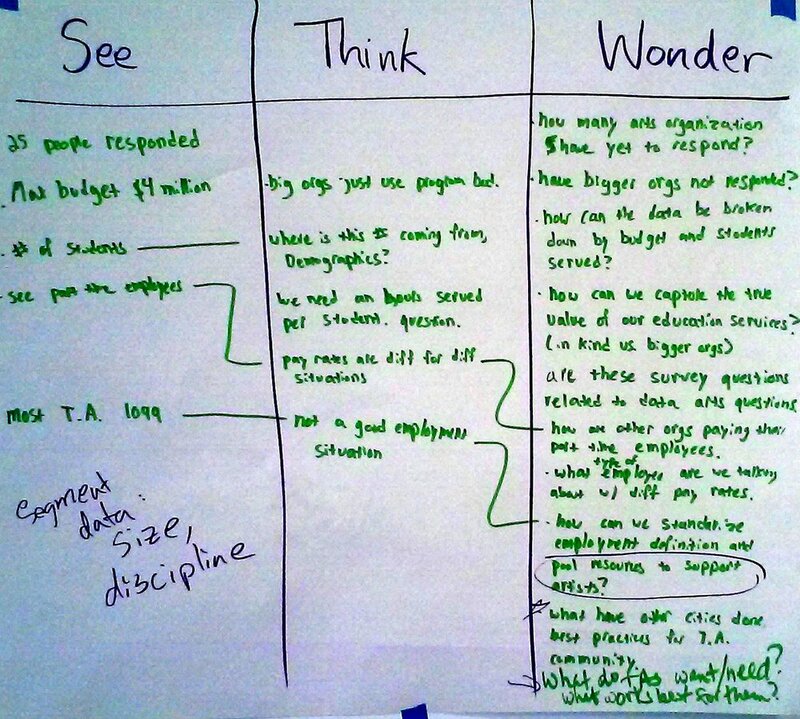 Our crew of 17 arts educators (see below for a list of who was represented) broke up into three groups to use a See, Think, Wonder routine to examine the data from the first 25 organizations that responded to the survey. The majority of respondents work in schools with K-5. There are very few full time teaching artists. Teaching artist pay varies widely. There is a significant number of volunteer teaching artists. Most respondents pay teaching artists to work outside of class time, for professional development and prep. Residencies are relatively under-represented in survey. The average operating budget is high, up to $4 million. Most teaching artists work part-time, and many are 1099 (working as consultants or contractors). Most of our respondents so far are the larger organizations. We don't have data about number of hours served per student or demographic information about the students served. Pay rates tend to vary for different activities. This is problematic and indicates that teaching artists' time is valued inconsistently. Many teaching artists are in a tenuous employment situation. There are a large number of small organizations. How does discipline, region, size of the organization, and employment status of the teaching artists affect their pay rate? What determines if a teaching artist is paid as part-time staff or contractor? How are organizations employing full time artists and not providing benefits? How big does an need to be to offer benefits? Did we get data from organizations that do residencies? And how do you define a residency? How many organizations pay the same rate for teaching and professional development? What rates are paid for prep time? How do we track the value of volunteers? How can we capture the true value of our education services? How are these survey questions related to Data Arts questions? How can we standardize employment definitions and pool resources to support artists? 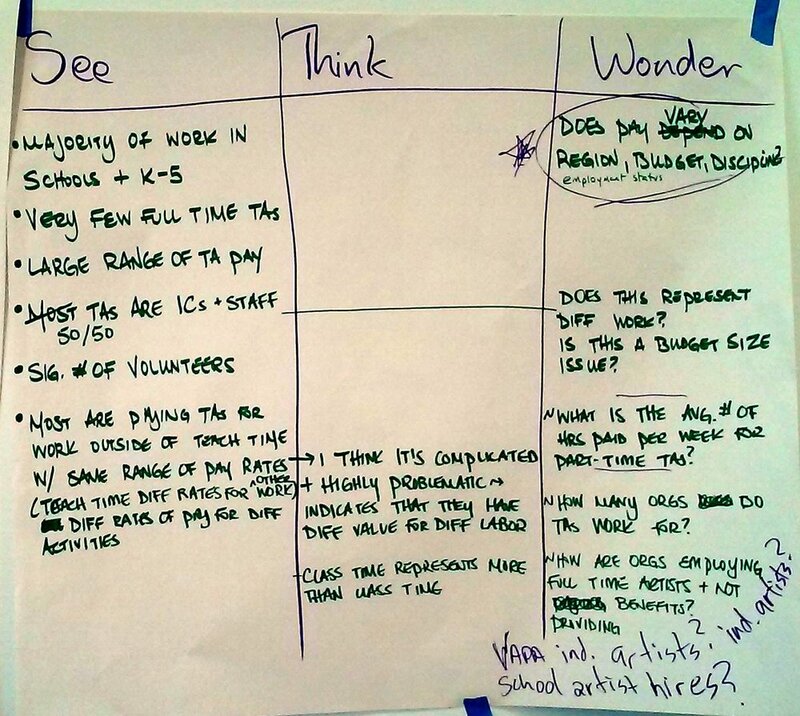 What have other cities done to figure out best practices for teaching artist employment? What do teaching artists want and need? We will dig into this question at our event on October 25. How many organizations have yet to respond? How can we find out about teaching artists hired directly by schools? What is the avg. number of hours paid per week for part-time teaching artists? How many organizations do individual teaching artists work for? Segment the data by discipline, location, organization size and other factors. As a community, figure out how we can support more full time positions. Could we have an organization that provides vetting, insurance, and other services for independent teaching artists and small organizations? Make sure that all teaching artists have access to information about all the places they can work. Consider what resources some sort of union or guild could provide (something that the Teaching Artists Guild has been working on). Consider a survey of teaching artists. How much money, how many hours, tip the scale for teaching artists to be able to afford travel time and time away from their own art practice? With a round of introductions, we quickly learned that we had assembled some very busy arts educators. Marin Theatre Company is preparing for their Young Playwrites Festival. American Conservatory Theatre will feature youth plays at the Strand on December 15. Richmond District Beacon Center is planning on a Balbooa Fright Fest on Balboa Street. SF Youth Theater is excited about its programming at Cesar Chavez Elementary School. Crowden Music Center will have a community music day, including an instrument petting zoo, on October 22. Young Audiences of Northern California is touring middle and high schools with its "I am, We are" program. Children's Art Center will be hosting open studios on Nov. 4. Friends of the Ruth Asawa School of the Arts will also be hosting an open studios (in Colleen's garage on Baker Street) and has upcoming shows listed at SFSotA.org. Community Music Center is looking to collaborate with writers. Streetside Stories will be working with English Language Development classes at Everret Middle School (many middle school students are required to take ELD clases as their elective instead of art). The Where Art Lives program will have an art reception for students at the Tenderloin Museum on October 19, 5-7pm.